Openings exist for full and part time positions 7 days per week. We can usually work around school schedules and second job schedules. We need 4pm until close dinner crew, 11am until 4pm lunch crew, and 5:30 am until 2 pm morning crew. Positions include front of house cashiers and servers and back of house kitchen prep, espresso barista, meal production, and baking. Locally owned and operated, our bakery cafe has been open for over 15 years. Put your passion for food and service to work in a job where you matter and can make someone else’s day better. 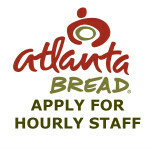 We are open 7 days per week from 6 a.m. until 9 p.m. Open availability, desire to do a job right, and knowing how to meet customer needs are key factors to being successful at Atlanta Bread. Crew positions are scheduled as early as 5 a.m. for opening crew, until 10:30 p.m for closing crew. Our bakers work night shift from 10:30 p.m. until 6:30 a.m. We need people who want to work. All employees must work at least one weekend day. Your availability is one critical factor to being hired. We schedule crew to be here when our customers need us here. HIRING FOODIES: We look for those who have a passion for food and service. Some of us consider ourselves food geeks, others just foodies. We want cafe team members who respect good food and fresh, healthy ingredients, quickly prepared for our customers. Maybe the pattern on top of the latte fascinates you or the combination of colors and flavors in a berry salad get you going. Have you ever found yourself absorbed in the patterns made in the many layers of a flaky strawberry croissant? If you get this, you may just fit in. 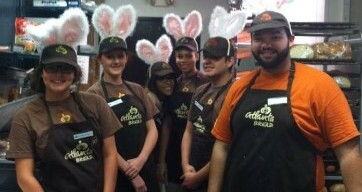 Yes, bunny ears! Hey, It was Easter! We value team work. We don’t hire dishwashers and cashiers. We hire people who want to help each other serve our customers. We find the best place for you to contribute to the team’s effort. You may love the interaction with customers at the register and in the dining room. Or maybe you love coffee and could be our best espresso barista. Of course we need those with skills in the kitchen making fresh, safe ingredients look and taste great. We work as a team and help each other get whatever our customer needs done – quickly and just the way they asked for it. Don’t let the name fool you. Atlanta Bread Huntsville is much more than just bread. For many people, we are the place between home and work to take a break and recharge with friends. We are a meeting venue for business people, friends, and families. We build relationships with customers. We serve great food for our guests who soon become our friends. As a family owned and operated business, our priorities are our people and our customers. We constantly work to improve our food and service and develop our people. Are you the right fit for our cafe? Most of all, You need to care about your customers and the people you work with. Not just on the surface either. You need to care about other people. We develop a relationship with our customers who visit us regularly. We get to know them and want to make our Bakery Cafe a regular part of their lives where they feel welcome, known, comfortable, and taken care of. Teamwork require’s that you respect and help each other. Teamwork at our cafe requires that you care about the people you work with. Helping people you care about comes naturally to the people we hire. Give us your basic information below. (less than three minutes.) We’ll get back with you for a follow up or interview. APPLY for all staff positions by paper form.